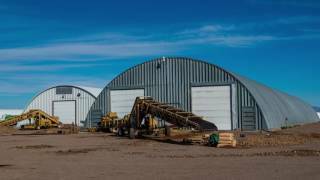 1,920 +/- acre potato farm and ranch for sale located in the San Luis Valley North of Alamosa, Colorado. There are 12 full pivots covering 12 quarter sections, and flood irrigation to compliment the water resources. Each quarter section includes a primary and backup well, surface reservoirs for re-charge and canal water. Canal Water: The San Luis Valley Irrigation District (Farmers Union Canal) provides additional water supply per pro rata share of the water available each year. Five subject fields would have 791 acres right in the district, translating to .76 acre feet per gross acre (600 acre feet of water). Current crops include a variety of Potatos, Triticale Wheat, Durham Wheat, Oats, Alfalfa and Sorghum. Pastures are available for cattle grazing. The income potential as a partnership, investment, corporate or personal farming operation with processing facility, variety of crops, water rights and structures presents an impressive investment. Priced at $10.750 Million, this farm is shown by appointment only, do not trespass, buyers must be pre-qualified prior to viewing. Note: Current photos are stock, actual farm photos and video will be forthcoming.